Not the result England wanted, beaten at home by Canada. The Lionesses are back in World Cup warm-up action on Tuesday when they face Spain in Swindon. Canada striker Christine Sinclair tells BBC Sport: "It was a battle, too of the top teams in the world going head-to-head. It was a matter of inches that won it. It was a great game. "These are the games you live for, the perfect preparation for the World Cup and two teams that will go pretty far in the tournament. "It is an honour to be chasing Abbey Wambach's record down and to get it over with but it is not something we want to be focusing on." Canada manager Kenneth Heiner-Moller tells BBC Sport: "We put on a very good performance and they are one of the best contestants for the World Cup tournament and we proved we are as well now. "We did not want to sit back, but could counter with our fast players up front. We always wanted to take the game and initiative back, even away from home. "It will definitely give us momentum, this was a big step for us and by far the best opponent we have played this year. We look good and trained good and won so we leave England happy. "Christine Sinclair is a huge person for this side and Canada. She does so much hard work off the ball." England manager Phil Neville tells BBC Sport: "I really enjoyed the match even though we do not like losing. It was a brilliant game of football and the players showed everything I wanted to see. "The players showed courage to play and Canada scored form their only shot on goal. We got into some good positions but we need to show a little more composure in the final third. "I felt relaxed watching and it was the type of test we needed against an experienced team. We handled most things well. "We had little periods of control, especially in the second half but our final ball let us down. We played most of the second half in their half and I saw things I liked and can build on. I am pleased with my players. "I will make changes for Tuesday, Lucy Bronze and Steph Houghton are out after suffering knocks. It is a chance for a few players to get some freshness and keep the momentum going forward. "This does not stop us from believing or going on the road where we want to." Manchester United manager Casey Stoney on BBC Four: "This is preparation for the World Cup so they would not have wanted to lose. Canada got very strong in the final bit of the match but England have to tidy themselves up on the second phase. "England will be very disappointed especially after coming off the back of winning the SheBelieves Cup. They need to analyse this, where did they go wrong and how they can improve it for the Spain game on Tuesday. "Phil Neville will want to rotate his squad for the World Cup but needs to work out his best players in their best positions." England captain Steph Houghton: "I think it is frustrating from our part. We played well, created chances but could not get it in the back of the net. We could have been more patient and their goal was one of their only shots on target. "We are developing as our team but you have to give credit to Canada. We wanted to be ruthless but it is not click." A much better performance from England in the second half, they played better and controlled it more but they did not have the finishing touch. You have to praise Christine Sinclair, what a player for so, so long - a real poacher but England will be disappointed by conceding. 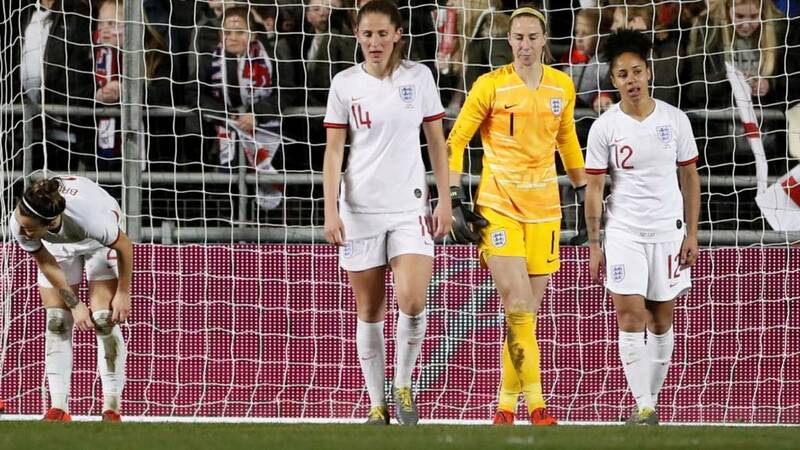 SheBelieves Cup winners England beaten by Canada in their World Cup warm-up game. ..caught by goalkeeper Stephanie Labbe. Ellen White down in the box under a challenge from Kadeisha Buchanan. The England striker clearly being pulled back, but the referee waves play on. Canada get away with one in injury time. A few more seconds being eaten away. Shannon Woeller comes on for Janine Beckie. England are now camped in the Canada half. England have a corner which is floated in by Beth Mead towards the tall Jill Scott, but Canada manage to get it away. FIVE minutes of time added on. Canada almost get a second! Janine Beckie has a go from long range and Steph Houghton almost converts into her own net after sticking a leg out at the ball. Goalkeeper Karen Bardsley was wrong-footed. Still England pass the ball around as they look for the leveller. Into the final few seconds. Canada happy to sit back, England will need some inventiveness to prise them open. Five minutes to go. Time running out for England to salvage something from the game. Toni Duggan trots off and Georgia Stanway comes on with six minutes remaining.